HUGH ELLWOOD Architect Artist Lecturer was educated in the classics and went to university in Rome to study philosophy. It was here that art and history became a reality and after four years he returned to Manchester to study architecture. Throughout his career he practiced as an architect with BDP, the UK’s largest multi-disciplinary organisation including a two year period in Rome. For over twenty years he was a partner in the practice. He has traveled extensively, photographing and sketching to record his tours. He has also followed a career as an artist and lectures to many organisations on various aspects of the history of European art and architecture as an accredited lecturer with The Arts Society. For latest travelogue, ‘Aegean Odyssey’, see under ‘Events’ in toolbar above. 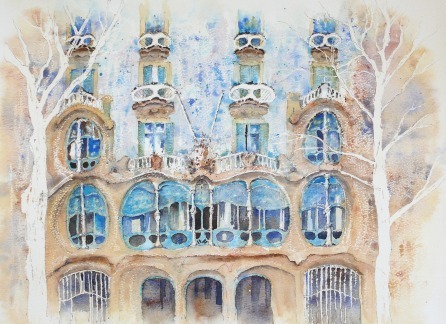 This watercolour of the Casa Batllo, a house designed by Antonio Gaudi, was done as a result of a tour of Barcelona to study his work. That tour formed the basis of a lecture outlining the work of Gaudi, an astonishing genius who produced forms of architecture unique to Catalonia and whose most famous design is the cathedral of La Sagrada Familia. Go to ‘Lectures’ for a full list and synopses. The Plaza Major in Salamanca is the finest in the whole of Spain and was built in the Baroque style between 1729 and 1755. 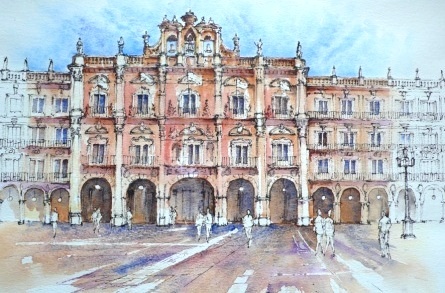 This watercolour is one of nearly forty carried out on a month’s study tour of Spain. See ‘Sketching in Spain’ under ‘Events’. The study tour also formed the basis of a lecture entitled, ‘Christian and Muslim Art and Architecture in Spain’. Comano is a small village in the south of Switzerland nestling in the foothills of the Alps. From one particular vantage point there is a striking view of the houses clustered on a hog’s back and cascading down the hill. 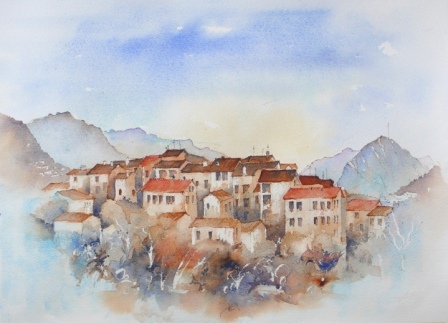 Go to ‘Demonstrations’ to see a step by step guide to how this watercolour was produced.